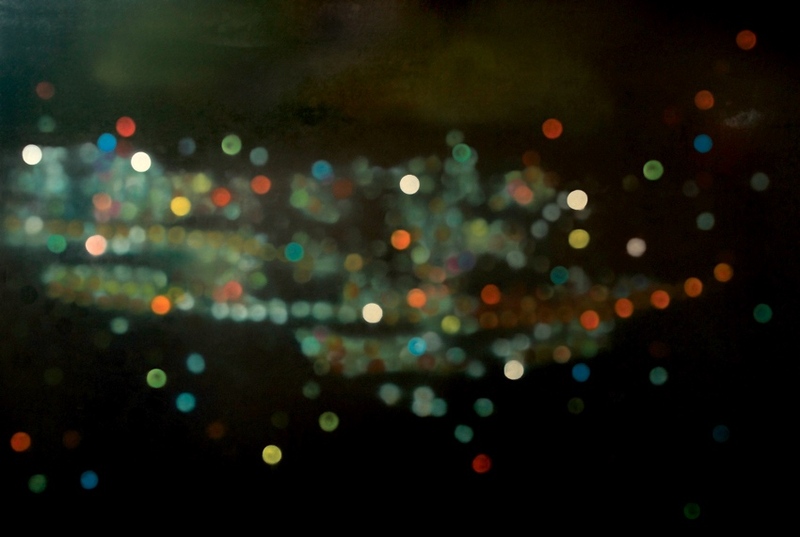 The bright lights of the city are a recurring metaphor representing the seduction of the ‘big smoke’, with its promise of fame, fortune and endless possibilities. Indeed the city at night, seen from a high vantage point like a lookout, appears almost magical. We can imagine the lives of those living amongst the beckoning lights and dream about who we could become and what the city has to offer us. Sometimes it’s more about the visual experience of watching the lights dance across our field of vision, forming a blanket of light circles that envelop us and wash away the stresses of everyday life. Benjamin Werner’s latest works draw on these experiences as their starting points, but push them visually to explore perception, seduction and music in a search for the sublime in contemporary life. The exhibition’s title is drawn from The Streets’ 2004 single about ecstasy, relationships and the sensory rush of drug and alcohol intoxication. Set at a working class wedding, it’s not hard to imagine the music clip’s scenes of drunk guests, cheating partners, and bad dancing, occurring in any number of venues that contribute to the glittering sea of lights that cloak every city at night and are the subject matter of Werner’s most recent body of work. The nighttime setting of Werner’s works sees globes of light pulse across the surface, but the rest of suburbia remains unseen, rendered as a deep bluish black of possibilities. The dark depths of the canvases make the suburban glamorous – gone is the urban grit of frequented streets, mismatched paint jobs and quirky garden elements. Any scenes of pain, hopelessness or debauchery are swallowed by the night, a time charged with possibilities, unhindered by the harsh light of day. These everyday experiences are forgotten as we’re seduced by the sublime beauty and simplicity of light. Where once the locations in Werner’s paintings were clear, this new body of work sheds the referent to engage more purely with colour, composition and sensory experience. Photographs and sketches taken from various cities initially inspire Werner’s circles of light, but during the creative process the artist becomes a composer, directing the circles like musical notes to create symphonies of colour. Many artists have explored correlations between colour and music over the past one hundred years. There were those who tried to capture the emotional intensity of music through colour, some who painted in response to specific musical compositions, and others, who created structured, mathematical relationships between the musical scale and the colour wheel resulting in colour organs that projected lights as notes were played. Werner’s works combine a number of these approaches. 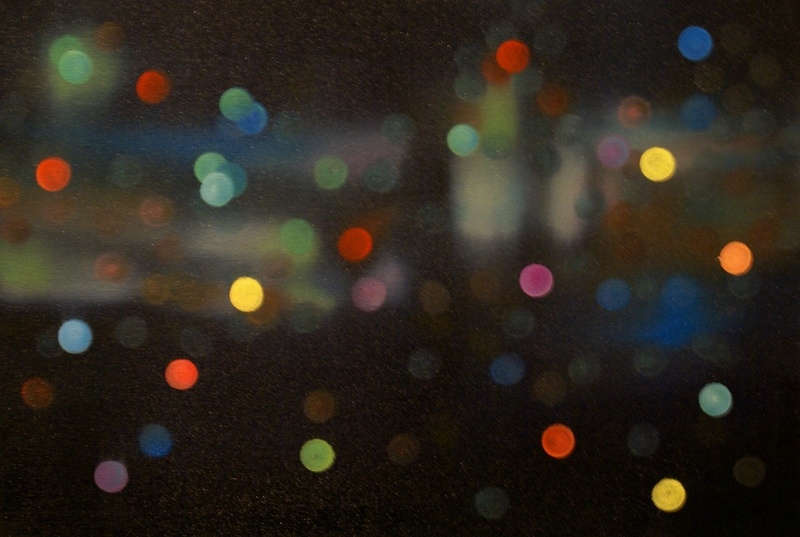 His soft focus circles are partly inspired by bokeh in music video clips, but he’s also influenced by the mood of music and how it speaks to his experience of life. The circles in his paintings dance and play, creating almost audible notes across the breadth of the musical scale but also suggesting melodies and harmonies as they come forward and others recede. If Werner’s paintings read as jazz or classical music, his latest works with LEDs are their dance music cousins with their intense colours threatening to overwhelm our senses. 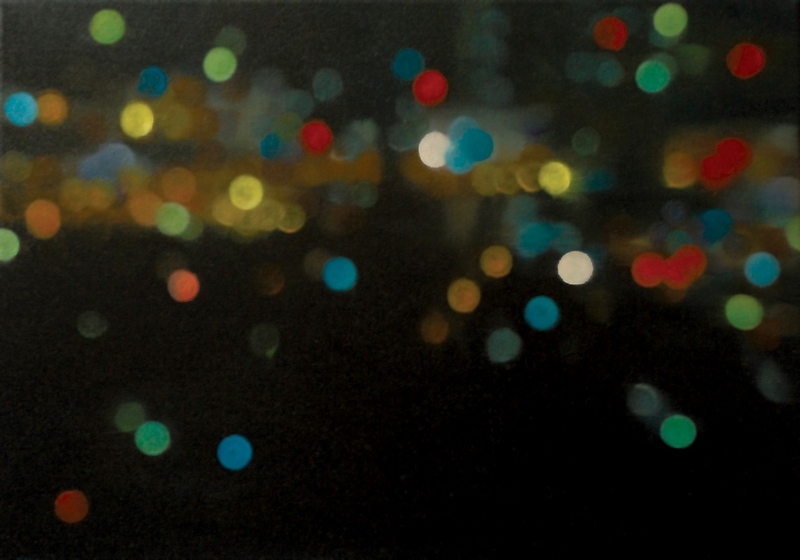 The artist refers to the lighting works as ‘neon-noir’, a term that describes the combination of hyper coloured lights and dark scenes, but also captures the metaphorical conflict at play between the bright, promising lights, and the sinister realities that lurk in the shadows. There is also a strong sense of movement and energy in the lighting works that suggests the pulse of the city and its inhabitants high on life. While this is also present in Werner’s paintings, they read more as meditations, where the city has been frozen in time, the artist capturing the aspiration of a place. In this way, Werner’s works are as much about stillness and being in the moment, as they are about the pace of the bustling city. The works in this exhibition may take their starting points from everyday life, but through the artist’s hand they become worlds unto themselves that mesmerise us, slowing drawing us in until we become blinded by their lights as they enfold us in their ironically dark embrace. © all rights reserved Simone Oriti. 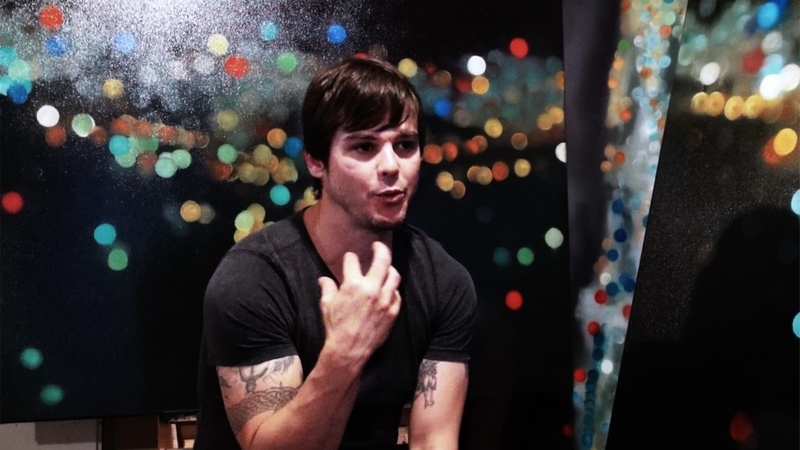 Header Image: Benjamin Werner, Artist talk, Blinded By The Lights, Judith Wright Centre of Contemporary Arts, 2014. This sophisticated and dynamic art exhibition by Benjamin Werner, combines oil on canvas, LEDs, domed ceramics and 1000+ laser cut acrylics to create a 21st century sense of the sublime. The artist has spent the last three years creating the exhibition that has evolved from previous bodies of work to focus on life experience and photography. Kerry Gillett. This sophisticated and dynamic art exhibition by Benjamin Werner, combines oil on canvas, LEDs, domed ceramics and 1000+ laser cut acrylics to create a 21st century sense of the sublime. The artist has spent the last three years creating the exhibition that has evolved from previous bodies of work to focus on life experience and photography. 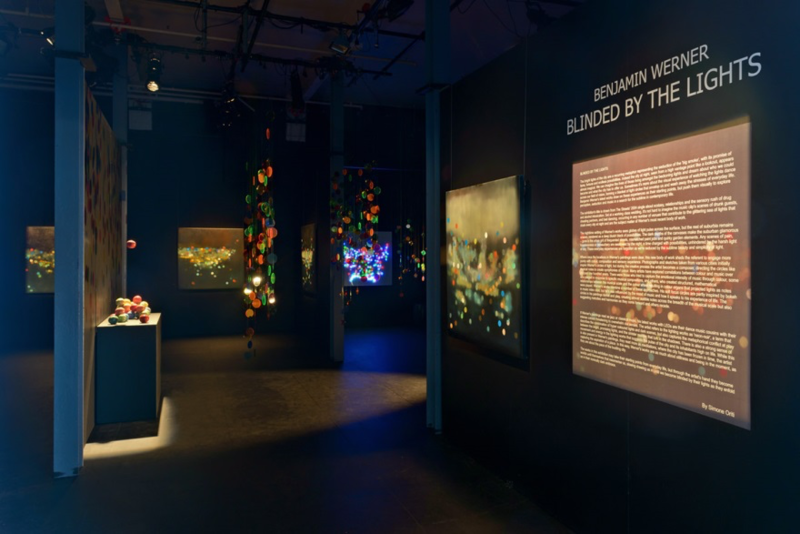 The exhibition’s title is borrowed from ‘The Streets’ 2004 single, which references not only drugs, alcohol and life, but the weird, edgy feeling that can haunt dark spaces both physical and metaphysical on a dazzling night. This exhibition is site specific. The artist created his exhibition knowing that he had total control over the ‘Shopfront’ space. Werner considered every element of the exhibition in terms of how it would be seen, including the voyeuristic windows that the ‘Shopfront’ space houses. The dark walls of the installation combined with intermittent lighting highlight the artist’s desire to represent his vision of subtractive and additive colour in painting, LED (light art), ceramics and installation. 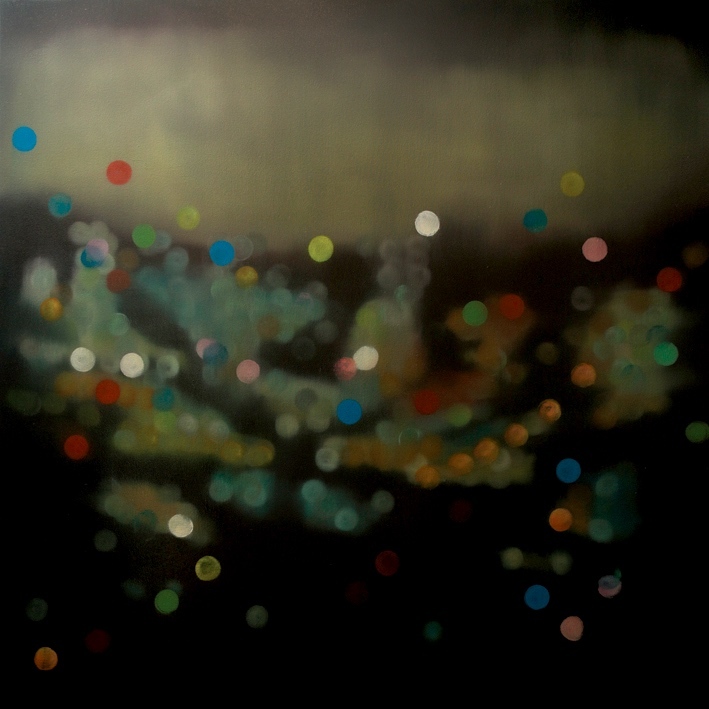 He depicts the poetic rhythm of a city at dawn or dusk, by spheres of colour that skip and play across the canvas, pulse suggestively through an LED, or allow light to pass through dazzling dancing disks to emphasize a single red ceramic globe. His paintings of varying size, display Werner’s trademark obsession with blurred, abstract, and spiritual spaces. They allow the viewer to see as much or as little as they want to and allow the viewer to create a narrative, as do the LEDs with their lively expressiveness. Last but not least, the museum quality installation of laser cut colourful disks, gives the exhibition an architectural link between the spaces, to ensure one body of thought provoking work where the black walls create the darkness necessary. Benjamin Werner is a New Farm based contemporary artist who has lived and painted in the historic Avalon building on Brunswick Street since 2004. Since graduating with a Bachelor of Fine Arts (Honours) QCA, he has tutored in, fine art, drawing, painting and graphic design. He is also an art collection and exhibition technician, who has worked both nationally and internationally. His artworks are held in corporate, public and private collections around the world. © all rights reserved Kerry Gillett.